T1 Audio Logger - Ships Overnight - 15 Day Free Trial! Just connect a USB cable, tap the T1 line and you're done! You'll instantly record up to 48 channels of audio in crystal-clear digital quality. Play back from any PC. Find calls instantly. Just click on the time and date. Copy, email, encrypt, and transfer calls on any computer. Powerful utilities let you search by Caller-ID, DID, or number dialed. PRI DID calls automatically sort in separate folders. All modern T1 formats are supported: PRI, Fractional T1, ISDN PRI, Japanese CRC... Easy setup! The USB 2.0 connection makes installation a snap! The included T1 Tapper lets you intercept every call with NO PBX reprogramming or rewiring required! Proven Value - Just $1295! 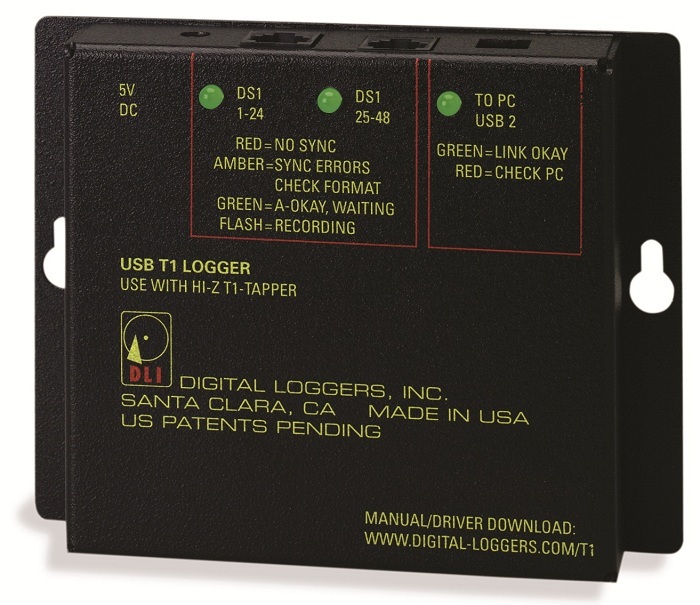 DLI loggers are proven in over 30,000 installations. Installation is a snap. Your logger is ready for immediate shipment and a risk-free 15 day trial. Download a spec sheet or preview the installation guide. Call (408) 330-5599 today for quantity discounts & support.